The ceramic kiln is one of the key machines in the ceramic workshop. 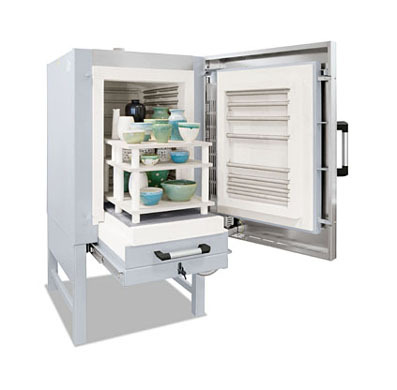 Nabertherm offers the widest ceramic kiln product range. Thousands of customers like hobbyists, schools, ceramicists, art departments, potteries and the ceramic industry rely every day on a Nabertherm ceramic kiln. The smallest ceramic kilns is available as top loading kiln with 16 – 220 liters volume or as chamber kiln with heating from two, three or even five sides providing for very good temperature uniformity. Sizes from 40 – 2200 liters are available. Good power rating ensures fast cycles also with high loading in professional workshops. Fast switching, noiseless solid state relays are used for an accurate firing cycle. Furthermore, the relays last much longer then traditional mechanical contactors. For regular stoneware firings Nabertherm offers a special ceramic kiln series with stronger insulation for a long life time. The intuitive controller shows the firing cycle but logs also important data like e.g. power consumption. Nabertherm stocks the most common ceramic kiln in the factory in Germany for a fast delivery. A reliable and fast after sales service is also very important. Nabertherm delivers also today for a ceramic kiln from the first hour spare parts within a short time and at fair prices. If none of our standard products meets your requirements our team of more than 40 engineers would be able to design also a customized ceramic kiln for you. Further information on Nabertherm ceramic kiln.